The nonprofit Aquarium of the Pacific is pleased to announce that Shelby, one of the Aquarium’s harbor seals, has given birth to a pup. Shelby is one of the Aquarium’s original animals and was two years old when the facility opened in 1998. Most seals give birth to young starting at four to five years of age. At twenty-two years old, Shelby is considered a mature mom, and this is her third pup. Shelby gave birth to her first pup, a female named Bixby, in April 2012 at age seventeen and her second, a male named Toby, in 2013. 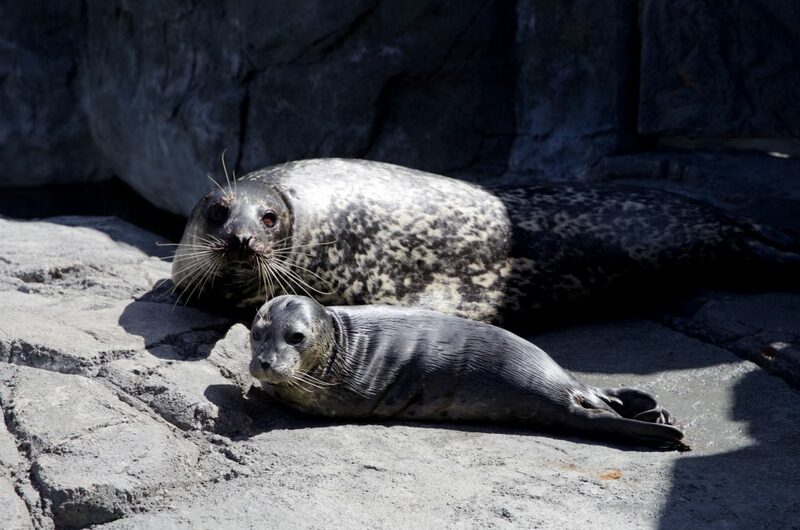 Bixby was moved to a zoo in the Midwest in 2015 with other female harbor seals, and Toby is slated to move to an aquarium in the southeast in May. Troy, the Aquarium’s only male harbor seal, is the father of all three pups and has lived at the Aquarium since 2007. “Shelby has had a normal, healthy pregnancy, and with her success at giving birth to two pups here at the Aquarium in recent years, we were cautiously optimistic about the arrival of her third pup. It is particularly special to the Aquarium that one of our charter animals has given birth to the next generation in the year of our twentieth anniversary,” said Dudley Wigdahl, Aquarium curator of mammals and birds. Shelby and her pup are in the holding area next to the Seal and Sea Lion Habitat. The shades may be open at times and closed at other times to allow for privacy for the mother and pup to bond. Shelby is a Pacific harbor seal. Harbor seals can be found in the eastern Pacific Ocean from the southern coast of Alaska to the northern portion of Baja, Mexico. Their color and markings are unique to each seal, like a human’s fingerprints. Some have light-colored fur of almost white to silver or gray with darker circular or ring marks. Others have darker fur with light-colored markings. They range in size from 4 to 6.6 feet long and weigh between 110 to 375 pounds (males tend to be larger than females). They may spend up to 85 percent of the day diving for prey, primarily schooling and bottom-dwelling fishes such as herring, surfperch, rockfish, salmon, and hake. They are also partial to some invertebrates, including crustaceans. They get the water they need from their food and live about twenty-five to thirty years in the wild and longer under human care. Harbor seals are protected by the Marine Mammal Protection Act. While the species is not currently listed as endangered or threatened, harbor seals are sensitive to human encroachment. The nonprofit Aquarium of the Pacific is a community gathering place where diverse cultures and the arts are celebrated and where important challenges facing our planet are explored by scientists, policymakers, and stakeholders in search of sustainable solutions. The Aquarium is dedicated to conserving and building nature and nature’s services by building the interactions between and among people. Home to over 11,000 animals, Aquarium exhibits include FROGS: Dazzling and Disappearing. Beyond its animal exhibits, the Aquarium offers educational programs for people of all ages. The Aquarium won a 2015 Travelers’ Choice Award for Aquariums, as awarded by TripAdvisor® travelers, and the 2017 TripAdvisor® Certificate of Excellence. The Aquarium offers memberships with unlimited FREE admission for 12 months, VIP Entrance, and other benefits. For more information, please call (562) 590-3100 or visit aquariumofpacific.org. Credit: The Aquarium of the Pacific. Photo Credit: Aquarium of the Pacific.